Some items I've designed and 3D printed. I want to show that 3D printers are not just for printing little knick knacks and toys. What started as a hobby project ended up becoming a real product posted on Kickstarter. The Sleep Sensei is a device designed to help you fall asleep faster via breathing training. A system to automatically open my curtains when my alarm goes off. 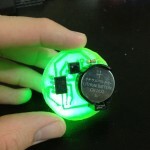 Uses a servo motor attached to a string to open the curtain, and uses IFTTT with Adafruit IO for communication. 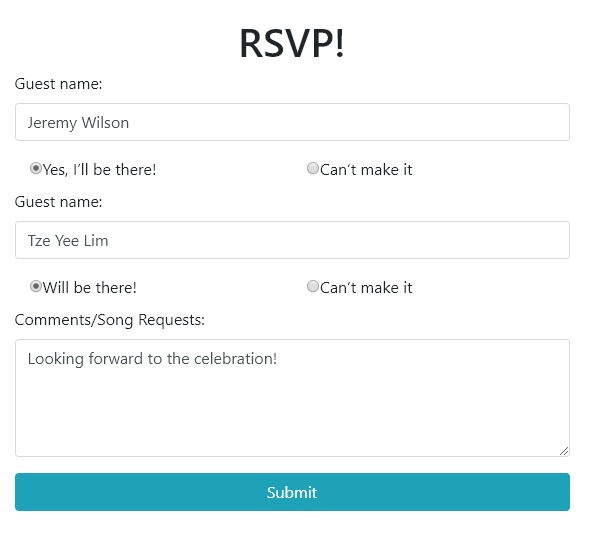 I wrote the front and back-ends for a website to allow guests who were invited to my wedding to RSVP online. The server-side code was written in Node.js, which interacts with a MySQL database to store and update invitee information. I used bootstrap to make a quick and simple interface. This was the game I created for Ludum Dare 37, the 72 hour game making challenge. Since I am interested in virtual reality, I decided to make my first real VR application. Players use their head to aim a ball and launch it to knock down blocks and earn points. 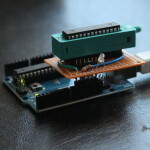 An open-source Arduino-based clone of the popular memory game Simon. 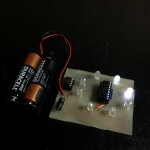 This post details the evolution of the design from a bread board to a nicely etched PCB. This project was a result of a weekend hackathon with my brother, Mark. 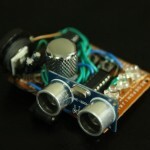 It uses an ultrasonic distance sensor to output tones and display lights based on the distance to the user's hand. I later etched a board for it. A Valentine's day gift for my girlfriend. 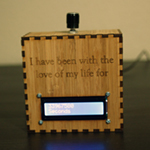 This project uses an Arduino, a 16x2 LCD screen, and a real time clock to display the amount of time we have been together. An alarm clock I made that makes you play a memory game to shut off the alarm clock. This is one of the more complex personal projects I've taken on! Using a custom Python script, I was able to turn a $20 android phone into a reliable time lapse capture device. I wrote another script to aid in compiling the final video. A recreation of the classic game Pong using an OLED screen and an Arduino. I used a couple of neopixel rings to add some flair to a Pikachu onsie for Halloween. A device I created for my workplace to display a pattern of lights used to make sure our cameras are not frozen. This project taught me the use of the 74HC595 chip for serial to parallel output. My first use of the ESP 8266 WiFi module. 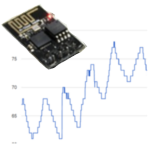 This project uses a DHT22 sensor to log the temperature in my room to a Google drive spreadsheet every 5 minutes. A board I designed incorporating the MAX7219 display driver, necessary components, and LCD screen in one neat little package. 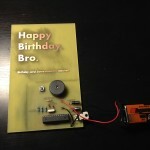 A birthday "card" I sent my brother incorporating an ATMega328 and a buzzer designed to play the overworld song from Chrono Trigger when a button is pressed. A Valentine's day gift that uses the basics of my Camera Show project in a heart-shaped PCB. A weekend project to create a beacon for friends to find me in crowded places, such as music festivals. 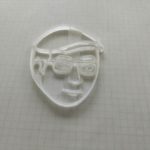 This project taught me best practices for PCB etching. In my quest to design the perfect interlocking laser-cut box, I found that I had to try many different designs before finding the ideal fit. 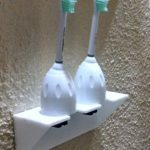 A laser-cut design I made to make storage of my Sonicare toothbrush heads sleeker and easier. 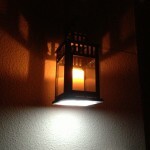 A craft project to add a series of LEDs to a candle lantern to provide additional light below. 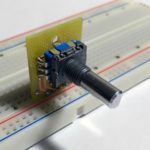 A simple PCB to make prototyping with a rotary encoder faster and easier. 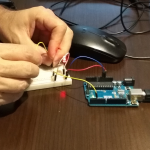 When buying new ATMega328 chips, it is necessary to burn the Arduino bootloader onto the IC before it can be programmed. This is my easy-to-use solution. An autonomous LabVIEW-based system I created to cycle through various hydraulic functions while acquiring data from pressure and position sensors. It more than doubled testing speed. 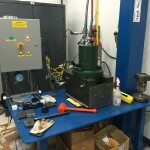 The first automated test system that I made as an engineer in the ATO Lab. 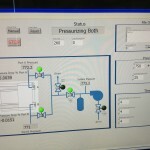 I designed the plumbing, wired up the components, and wrote the software and GUI. It ran overnight and tested over 10,000 cycles. A high-channel-count data acquisition system I made using CompactDAQ and LabVIEW that could take 1000 Hz data from 48 channels. 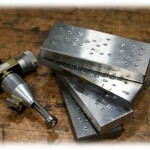 It was designed to be very user-friendly since many technicians on several shifts would be using it. 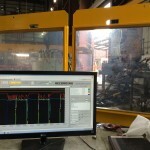 Working with a fellow Edison Engineer, we looked into many sources of error in Brinell hardness reading including human error, heat treating, grinding media, type of scope used, and hardness punching methods. Once a year the GE Oil & Gas facility has a family day, and the ATO Lab prides itself on putting on the best show possible. These are some of the projects I made for family day over the years. 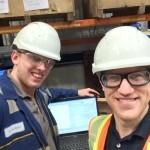 I was flown out to Aberdeen, Scotland to help train their instrumentation technician in LabVIEW. We ended up developing a valve pressure cycling system from the ground up, allowing for automatic pressurization and depressurization of valves under test. 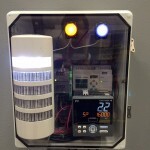 This project involved converting an existing fixture to be automated with LabVIEW. I created new control hardware and software from the ground up and made an independent remote-operated hydraulic power unit. A relatively inexpensive data acquisition system I made to get a sister lab up and running with modern data collection. It was made to be simple to use and included full documentation. They liked it so much that they asked for 3 more! I received a lot of training and hands-on learning while working in the ATO Lab. 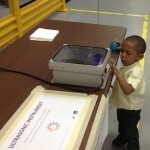 But, I also held some training sessions of my own and created tools to help others learn hands-on. During my time in the lab I was able to identify many processes that could be improved using technology. 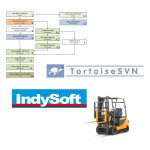 I created a test request process, upgraded the warehouse inventory system, implemented a sensor calibration database, and started a code repository. Most of the testing that occurred at the ATO Lab was potentially dangerous, and after a near-miss new safety measures were required. 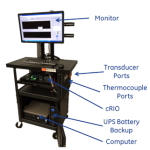 I came up with a system that required "heartbeats" from the test control system and the PC before the system could be energized. 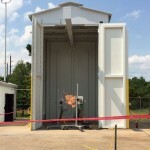 I provided the data acquisition system for the fire test facility. It included logging pressure and temperature sensors and setting up PTZ cameras for remote test monitoring. 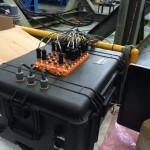 This data acquisition system was designed to be placed in the field, connected to up to 8 4-20 mA sensors, and left to collect data automatically for up to 4 weeks. 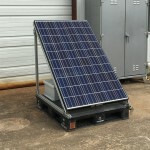 I wrote the LabVIEW Real Time software and determined the system's power needs to size the solar hardware.